Over three years ago episode 26 [watch, read] covered the subject of mass assignment and how it can cause security vulnerabilities. Rails 3 is now out and has a lot of security features enabled by default but this is one area that isn’t. Rails applications’ models still need to have their attributes protected against mass assignment in order to avoid malicious users updating them by sending POST requests to the server. If you aren’t familiar with this problem then take a look at episode 26, but in essence whenever you create or update a model in your controllers by using mass assignment you need to use attr_accessible in the models to protect the attributes you don’t want to be updated otherwise users can set any attribute and this can lead to huge security problems. It seems easy enough to add a call to attr_accessible in every model but there are two potential problems when doing so. The first problem can occur when you’re testing your app. Sometimes you want to mass-assign attributes during testing and having models protected with attr_accessible can make this difficult. One solution to this is to use factories, and this was covered in episode 158 [watch, read]. The second problem is that attr_accessible is not dynamic. The attributes that are specified by it for a given model are hard-coded and if we want to change the attributes that are accessible based on, say, the user’s permissions that can be difficult to do. This was the case in Rails 2 but Rails 3 gives us a new way to make dynamic attributes and we’ll show you that in this episode. To demonstrate dynamic attributes we’ll use a wiki site. This site has a number of articles and an article can be edited by anyone. On the edit form, along with the name and content fields is a checkbox field that allows a user to mark as an article as ‘important’. When an article is marked as important its title will appear in red. We’re going to modify the application so that only administrators can change the importance of articles; non-admin users should not be able to modify the important field. It would be easy enough to modify the form to remove the checkbox so that it is only shown to administrators, but this wouldn’t solve our problem as it would still be possible for users to bypass this form and send a POST request that would modify the important field for an article. The solution to this problem lies in the controller and model layers, specifically the create and update actions in the ArticlesController as it’s here that the mass assignment happens. One approach we could take to protect the important attribute would be to remove it from the parameter hash unless the current user is an admin. 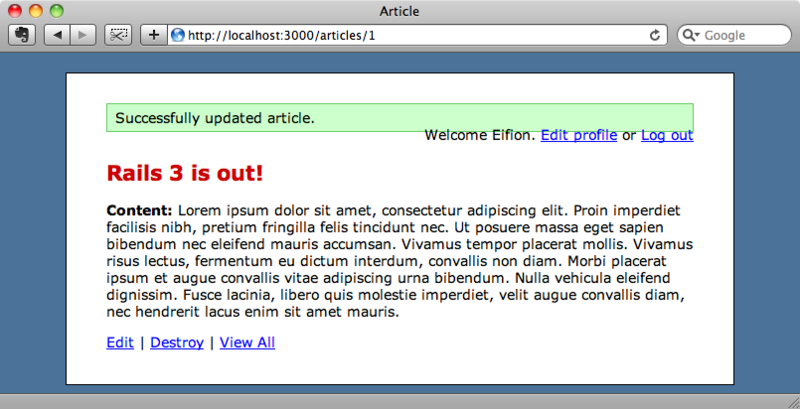 flash[:notice] = "Successfully updated article." The trouble with this is that we have to remember to do it for every attribute we want to protect. Also there is no correlation with the attr_accessible call in the model. It would be much better if we could instead make attr_accessible dynamic. We’ll take a look at the Rails API documentation to see if we can find anything about attr_accessible that can help. An interesting thing to note in the documentation is that attr_accessible is now included in the ActiveModel::MassAssignmentSecurity module, not directly in ActiveRecord. This means that it can be included and used within any class and this makes it much more flexible. At the top of the documentation page is an example of ActiveModel::MassAssignmentSecurity used directly within a controller instead of through a model, which is a really good idea. What’s really interesting though is a piece of code that shows us how to make attr_accessible dynamic by overriding the mass_assignment_authorizer method. The code above changes the behaviour of the application based on whether the user is an admin or not which is exactly what we want to do. By overriding this method in our models we can change the fields that can be modified by mass assignment depending on any condition. This is a simple enough class with just an attr_accessible call with three attributes. The :important attribute is the one we want to make dynamic and we can do that by overriding mass_assignment_authorizer in the class. By calling super in mass_assignment_authorizer we’ll get the default behaviour which returns a whitelist sanitizer. You don’t need to be familiar with how this works to use it, you just need to know that you can add more attributes to it as we have done above. Once we’ve added this extra parameter here we can remove it from the list of parameters in attr_accessible. The changes we’ve mades so far won’t alter the behaviour of our application at all but we can make the accessibility of :important dynamic now as it’s defined in an instance variable rather than at the class level. We’ll do this by adding a variable to the class that will contain a list of the attributes we want to be accessible. Any parameters passed to accessible will now be added to the list of accessible attributes and we can use this in our controllers. We’ll modify the update action so that it adds the :important parameter only is the current user is an admin. @article.accessible = [:important] if admin? We can start up our application now to see if these changes work. If we log in to the application with an account that isn’t an administrator and edit an article, marking it as important, when we’re redirected back to the article’s page the headline is black indicating that the important field hasn’t been changed. If we make our account an administrator and edit the article again, this time the important field is updated and the headline changes colour. Ideally admins should be able to edit any of the fields so it would be useful if accessible supported an :all option that would allow us to easily make all of a model’s attributes editable. We can do this by modifying mass_assignment_authorizer. The method now checks to see if accessible is equal to :all. If it is then we need to return something that will make all of the attributes modifiable. It would be good if we could just return an empty array, but unfortunately the object that is returned by mass_assignment_authorizer is a sanitizer object so this won’t work. The way we’ve have worked around this is a little bit of a hack but it works well enough: we return self.class.protected_attributes. This is used by the MassAssignmentSecurity module to provide a blacklist of attributes that can’t be modified. As we’re not using attr_protected in this class it will allow all attributes which is just what we want here. 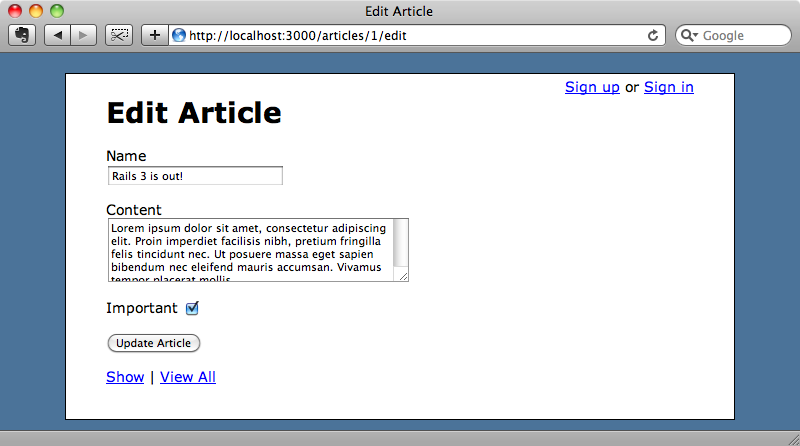 We can now modify the ArticlesController to make all of the Article’s attributes accessible by passing :all. @article.accessible = :all if admin? If we test this out in the application we’ll see that admins can still edit the important attribute. In the controller we also need to apply the accessible option to the create action. If we just apply it like this then it will not work. The reason that this doesn’t work is that the mass assignment happens in the new call so by the time we’ve set accessible it’s too late. We need to separate creating a new Article from assigning its attributes and slip the call to accessible in between the two. flash[:notice] = "Successfully created article." You might want to make this behaviour more abstract and remove the duplication in the code in the two actions but this is dependent on how your permission system works so we’ll leave this up to you. One change we will make though is to extract the mass_assignment_authorizer method out from the Article model so that it can be used in all of the application’s models. We’ll move the method into an initializer. In the /config/initializers directory we’ll create a new file called accessible_attributes.rb. That’s it for this episode. We’ve now made attr_accessible completely dynamic and can change its attributes based on a user’s permissions. What’s good about this approach is that everything is locked down by default and access is only granted where we explicitly specify it in the code. This makes mass assignment security issues a much smaller problem as by default all attributes are secure.